Custom Sender Domain is available on our Ultimate Plan. 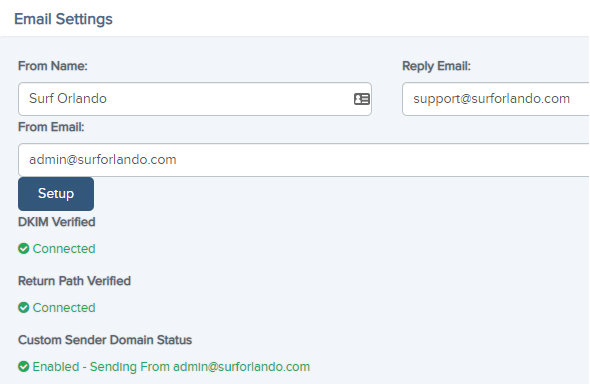 Custom Sender Domain allows you to send all emails from TrustSpot using your own From Email, as opposed to using the TrustSpot From Email. Note: This feature requires technical knowledge of your Domain's DNS, if you're not comfortable setting this up - please ask your site administrator. Click Automatic Email Settings (for CR or PR), and scroll down to the Email Settings area. You will see a new setting for "From Email"
Enter in your From Email, than click "Setup"
Note: You MUST complete the Setup process before you can start sending from your own domain name. After you've copied down the values, click Finish. You will need to apply these updates to your domain's DNS in order to complete the process. DNS propagation time may take a few hours to complete, and in some rare cases up to 24 hours. Once DNS propagation is finished, your email settings will automatically update to start sending with the new From Email. You can see the status at anytime by going to the Email Settings area. Have a question or need support on this feature?